The story of an institution that inspired a comedy revolution. A modern-day parable set during the 2008 housing crisis. On paper, these two films would most likely not make for the smoothest double feature. However, the films Drunk Stoned Brilliant Dead: the Story of the National Lampoon and 99 Homes share a commonality: Columbia-affiliated directors. Drunk Stoned Brilliant Dead opened at the IFC Center on September 25, 2015. It first was shown at the 2015 Sundance Film Festival on March 22, followed by the 2015 Tribeca Film Festival on April 16. It tells the story of the National Lampoon comedy franchise, from its Ivy League origin as a magazine to spawning a film franchise and changing the face of comedy forever. The film features numerous interviews from comic giants who both got their start and drew inspiration from National Lampoon, including Chevy Chase, Judd Apatow, Kevin Bacon, John Goodman, and Billy Bob Thornton. It also, according to its official synopsis, “unearths never-before-seen archival footage and brilliantly weaves it together with the magazine's beautiful and often shocking art,” truly displaying the counterculture reputation the brand received in the 1970s and 1980s. Drunk Stoned Brilliant Dead has received rave reviews, with Variety calling it "punch-drunk and very much alive […] a generous and briskly entertaining doc that traces the titular humor magazine's lasting influence on American comedy." Douglas Tirola '92SOA directed Drunk Stoned Brilliant Dead as a part of his movie and television studio, 4th Row Films. Mr. Tirola received a BA in Philosophy from Miami University and his MFA in writing from Columbia University School of the Arts. He is most well-known for his work on A Reason to Believe, Hey Bartender (nominated in the Special/Documentary category at the 2015 James Beard Foundation Broadcast Media Awards), and Actress (nominated for Best Documentary at the 2014 Gotham Independent Film Awards). Tirola decided to make Drunk Stoned Brilliant Dead after seeing the similarities between the work of the Lampoon and his own filmmaking. In an interview with Indiewire, he says, "To me, the story was about this moment in time when all these people came together. I always like to say 'imagine our worst fear that all of life is like a high school cafeteria.' And what I felt about the Lampoon was that these guys would never have been at the same table, but in pursuit of making this great magazine, every month a different theme, they came together. I could relate to that because that is how I feel about independent filmmaking. That was my way into the film." 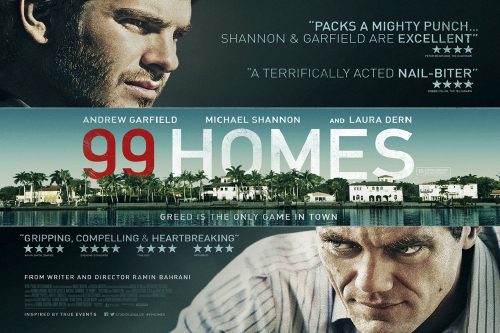 99 Homes also opened on September 25, 2015 at two locations in New York City, proceeding to fill more screens in New York City, as well as Los Angeles, Chicago, San Francisco, Boston, and Washington, D.C. on October 2, 2015, and releasing nationwide on October 9, 2015. It is a thriller played against the background of a real estate crisis. Featuring performances from Golden Globe nominee Andrew Garfield and Academy Award nominees Michael Shannon and Laura Dern, a recently evicted single father must join the tutelage of a charismatic and ruthless businessman to get back his home, which draws him into the lifestyle of the wealthy and glamorous with emotionally devastating results. The film premiered at the 71st Venice International Film Festival on August 29, 2014, where it was crowned Best Film amongst the young jury members and received a SIGNIS Award Honorable Mention, going on to screen at the Telluride Film Festival and the Toronto International Film Festival before Broad Green Pictures acquired its distribution rights. More recently, it played at both the 2015 Sundance Film Festival and the 2015 Deauville American Film Festival, where it won the Grand Prix prize. Extremely positive words have doused 99 Homes, receiving large kudos from such notable outlets as The Village Voice, The Huffington Post, TIME Magazine, and The New York Times, which called it "a masterpiece of suspense." Pete Hammond of Deadline went so far as to write, "Few films I have seen in recent years have cut so close to the bone as this one does" and called it a legitimate contender for several Academy Award categories. The largely positive reception for 99 Homes is only natural considering its director and co-writer: Columbia College alumnus and Assistant Professor of Film at Columbia University School of the Arts Ramin Bahrani. After receiving his BA in Film Studies in 1996, he went on to create his first feature film Man Push Cart, which won over ten prizes internationally and received three Independent Spirit Award nominations. He then produced several films over the next decade, including Chop Shop, Goodbye Solo, and the short Plastic Bag, which featured voiceover from the legendary Werner Herzog. In 2009, Bahrani received a Guggenheim fellowship and has been the subject of retrospectives in venues such as the MoMA, Harvard University, and the La Rochelle Film Festival. In preparation for the film, he dove fully into the world of foreclosing homes, and chose to focus his work on the working class. "Probably the one thing is that I like to tell stories about people or worlds that I haven't seen in other films," he says in an interview with The A.V. Club. "Since Hollywood seems to be more interested in people wearing tights and using powers, there seems to be a fertile ground for movies about real human beings. The movie's a thriller, a Faustian deal with the devil, and those are archetypal structures that we know and respond to. We can connect with them. But, the world they take place in is new. It was a world I didn't know about, that I was inspired by researching." Bahrani dedicated 99 Homes to the late film critic Roger Ebert, who hailed him as "the best director of the decade" after the premiere of his film Chop Shop. This story originally appeared on the CAA Arts Access website. To view more stories like this and to become a member, click here.